With the new ultra book line up of laptops hitting the market its all about having the computing power of the top of the line laptop and the weight and thin profile of a net-book. Now that's leading to more and more laptop-tablet hybrid devices. Laptops have the advantage of their productivity and the comfort of the keyboard. Tablets have the advantage of being light weight and ultra portable and give the best browsing and entertainment experience. ASUS is one company that been putting in a lot of efforts into these laptop-tablet hybrid devices. In the past ASUS came up with Eee Pad Transformer Prime. Now with the Windows 8 OS at hand things seem to have have become a lot easier for these kind of hybrid devices. About a week ago popular computer hardware manufacturer ASUS unveiled to the world its new line up of Windows 8 ultra-books, tablets and desktop PCs at the Computex 2012 in TAIPEI, Taiwan. 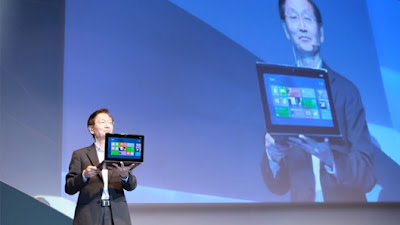 Although what really caught the attention are two devices in particular, the ASUS Taichi (dual screen) and the ASUS Transformer. ASUS claims the ASUS Transformer Book to be the world’s first convertible ultra-book. Just like the Eee Pad transformer. The screen of the laptop simply detaches to turn into a independent tablet device. This provides its users a seamless computing experience. Its aimed at users who prefer the portability of a multi-touch tablet computer for entertainment, and also want to use the device as a traditional laptop for productivity and work. Remember its an ultra-book so there is no compromise on the hardware. Other specs include USB 3.0 port, dual cameras, with a HD front-facing camera and a 5MP rear-facing camera. It also features ASUS SonicMaster technology. The ultrabook is available with an 11.6”, 13” or 14” Full HD IPS display with multi-touch. The ASUS Taichi is an ultra-book device unlike any other seen before. The most striking feature of the Taichi are its dual screens. There is one screen on the inside and surprisingly one on the outerside of the lid. This makes the device an ultra portable ultra-book on the inside and a multi-touch tablet on the outside. With a touch screen on the outside of the lid, the TAICHI opens up a whole host of new mobile possibilities as it plays the role of both ultra-book and tablet. Both the screen access the same hardware but are independent to each other. What that means is that you can have something diffent running on the outside and inside at the same time. The outer screen has full support for multi-touch and also stylus support. With the lid open, the TAICHI is just like any ultrabook computer, and comes With the lid closed, however, the TAICHI instantly becomes a multi-touch tablet computer with bringing a degree of flexibility that has never before been experienced on an ordinary ultrabook. Better still, while they provide access to the same hardware, the two screens are completely independent of each other and can also be used simultaneously, which means the Taichi can be shared with two users for a host of innovative new applications. The device seems perfect for a small presentation or sharing photos videos with your family and friends. There is no detailed specs available as of now, all we can say is it features the 3rd generation Intel Core i7 processors, SSD storage and DDR3 system memory, and comes with built-in dual-band 802.11b/g/n Wi-Fi, two USB 3.0 ports, HDMI and DisplayPort connectivity. Other features include dual Full HD/IPS panels, each at 1920 x 1080 resolution. It comes in two models 11.6” and 13.3". The device seems pretty innovative although no details about the release or pricing have been told yet.